Not too long ago, I would have thought ‘cauliflower rice’ sounded kind of depressing. I mean, let’s be honest – it’s not the same as real rice. (For the record, I still find cauliflower pizza crusts to be depressing and am working on a primal pizza crust that doesn’t have a bajillion calories. If you haven’t tried it, though, you might be surprised at how well cauliflower functions as a rice-like base for curries and stir-fries. Aside from kind of looking like white rice, it has a neutral flavor and even manages to soak up a little sauce. Furthermore, if you’re the type who has a hard time getting in all your veggies, this is a practically effortless way to pack in a substantial amount of cauliflower. What was once a huge head is reduced to 4 modest-looking mounds of ‘rice’ after cooking. Even when I’m making Asian dishes, I have grown accustomed to not including rice and I find that I don’t even miss it. I’d rather have more of the actual dish than just some boring old rice anyway. However, the other night I was making a Sri Lankan coconut chicken curry that was not only on the spicy side but also had a fair amount of liquid. This is when something like cauliflower rice comes in handy. The cauliflower helped to absorb some of the sauce and even out the spicy flavor. I’ve seen recipes that call for steaming or microwaving the cauliflower rice but I can’t imagine why you’d want to cook it that way unless you are looking to save a few calories. It’s not really faster and since it absorbs water during cooking, the rice won’t be absorbent on the plate. Here’s how I prefer to make the rice. Check back tomorrow for the Sri Lankan curry. Use the large holes on your cheese grater to grate the cauliflower into small pieces. Heat the oil or butter in a large fry pan over med-high heat. Add cauliflower and cook until the cauliflower is soft and starting to get a little toasty. If you want to get fancy, you could throw in some chopped garlic near the end. I hate grating the stuff. I’ve half thought about getting a food processor just for this reason. Good alternative otherwise. No on the cauliflower crust? I’ve fed my pizzas to full on cauli-hating SAD subscribers and they liked it! Sure it’s not quite a stuffed crust deep dish, but should that be expected? To be honest, I’ve only tried the cauliflower crust once and it came out a little mushy. But aside from the mush factor, I didn’t care for the sweet taste of the cauliflower next to the the pizza flavor. I want to develop something more neutral. Keep this up especially the simple stuff. Long story short, if it is yummy I can slowly convert my family over. I can’t handle the grating, either… I tried once, and got so bored, I resorted to our ol’ cauliflower standby: mashed cauli-tatoes. all in a big pot (add water to just about cover the cauli), bring to a boil, and boil about 15 min, until soft. Drain off the liquid, and mash it all up (I use a hand blender). Butter, salt, pepper to taste. A shot of coconut milk makes it irresistible. Grating cauliflower makes me want to cry! But it turns out a-ok if you whack it in a blender a few chunks at a time, just stop before it turns to mush. If you can’t commit to the cost/storage of a full food processor, get a stick blender with a processor attachement (I have a great Braun one). 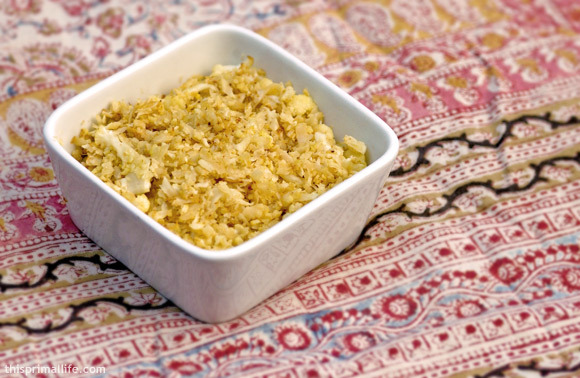 It takes a couple of seconds to rice the cauliflower, and is easy to wash up. I agree with others, I make quick work out of “grating” cauliflower by using my food processor. This fried cauliflower rice is one of my family’s fave’s for breakfast – cooked in the bacon grease of the choppped up bacon I cook up with it and garlic and sometimes scrambled eggs. Oh and regarding cooking the cauliflower first, it’s a whole different sensory experience when it’s cooked first than when it’s fried raw. Thanks for this recipe too. I’m gonna try this out to make some fried rice and orange chicken this week. I bet it’ll be fabulous with fresh eggs from my hens! I wish I had read the advice above about using a food processor earlier! After hand-ricing the kitchen (and my laptop) was covered in bits of cauliflower! It was all worth it though. Very very tasty with beef and salsa tonight and going to try it with a chicken curry tomorrow. And I’m going to consider grating cauliflower a workout as well (lol!). My right bicep is going to be huge! Thanks for the recipe! Waiting til the hubby gets home to try it out!